WordPress is a free open-source CMS, the world's most popular platform for publications on the web. It powers 26% of websites, which makes WordPress the obvious choice for newbies looking for a publishing platform. Based on PHP and MySQL, WordPress had been initially released in 2003. Many respected companies such as Sony, BBC America, TechCrunch, Ford, and others are using it today. Every tech website holds it their duty to publish a post about how to start a blog on WordPress or how to use this CMS. 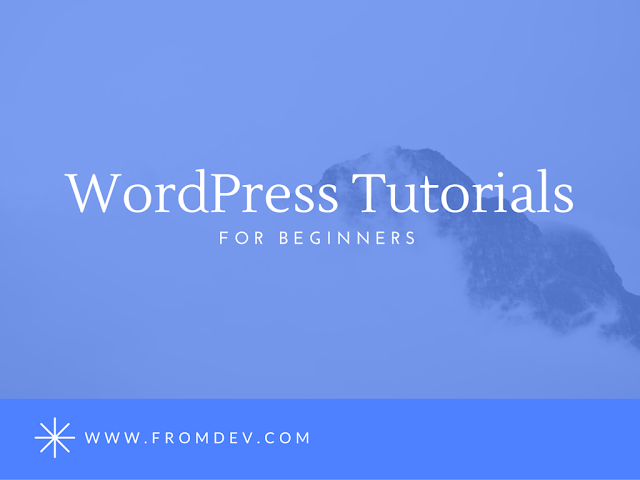 With tons of such content available, beginners feel inspired and ready to become WordPress experts here and now. But with so much choice, things often become confusing. WordPress is relatively easy to use and customize with hundreds of themes and plugins available. Yet, dealing with all that stuff looks daunting when you are a beginner. And it happens that blog articles or mediocre tutorials do nothing but complicate things for you. It's hard and time-consuming to surf the web for picking the best WordPress guides. We've done it for you. Below are ten best tutorials that will introduce you to this content management system and help you build an awesome website. This tutorial is from WordPress programmers, and it covers everything around the CMS. It might take you weeks to read, but don't worry: written with a plain language, it's easy for beginners to understand and get the idea of WordPress and its features. First of all, it provides introduction to blogging and WordPress semantics, shares codes to write in your posts, teaches you to design headings and use images, and covers the problem of WordPress security to protect your website from hackers. The video tutorials from Lynda teach you how to install WordPress, how to use it for creating a self-hosted website, how to design themes, publish images, and configure your blog for SEO. Their step-by-step guides help to download and install WordPress, as well as create a successful e-commerce website with this content management system. More than 50 tutorials are available at Lynda right now, so one can find answers to all questions they might have on WordPress. Here you'll find numerous guides, plugins, and themes for your WordPress. Their tutorials cover all important concepts in one place: installation, templates, navigation, plugins, etc. They add latest themes, best WordPress podcasts, freebies, and more. Users are welcomed to submit their themes and plugins, too. What makes WPExplorer worth your attention is their guides and reviews of informative videos for WordPress beginners, as well as their tips on using this content management system for creating e-commerce projects. The ultimate list of WordPress tutorials for both beginners and advanced users, Smashing Magazine is worth checking for those willing to master this content management system: hacks, coding techniques, plugins, templates – the list covers the most popular articles related to WordPress. Bonus: they share interesting and informative e-books on web design, so you can also get new skills for making your WordPress blog good-looking and user-friendly. This tutorial will help you configure WordPress after installation. All settings are well-explained and easy to understand for beginners, familiarizing users with the WordPress admin area, how it operates, and how its changes might affect your website. Founded by Syed Balkhi in 2009, this resource provides tips, tricks, and hacks for beginners on improving their WordPress websites. Real-life examples and best practices described here allow to learn this CMS faster. For those willing to know everything about WordPress plugins and themes, Tuts Plus offer courses, books, and tutorials of high quality. Split into sections, they are updated every few days and provide the WordPress latest news to readers. Learn how to develop your publishing platform, customizing it; reveal everything about its interface and filters; find out how to protect WordPress admin panel from hackers; read how to work with metadata, etc. This website updates their blog twice a week, sharing WordPress useful tutorials for both beginners and intermediate users. More than 4,000 articles are in their archives, covering tips and hacks on WordPress, which makes WPMU Dev one of the most read WordPress resources. LevelUp offers video tutorials on how to use WordPress. Beginners are welcome to check 30+ podcasts about the CMS installation, options, widgets, themes, plugins, and other features. It will take you less than ten minutes to listen to each of them and learn essential details about WordPress. This service is known for their dashboard, but their regularly updated blog covers all significant aspects of using WordPress platform with a focus on themes, plugins, guides, and services. Here you will learn how to manage the platform, how to run it on Mac, how to secure it, how to add custom codes to WordPress, etc. These tutorials will teach you the essential concepts of WordPress, including installation and step-by-step guidance on managing a beautiful and user-friendly website. Are you a blogger, designer, or developer willing to build or improve your WordPress website? This list of tutorials is the place to begin. Hugh Beaulac is a tech geek and big fan of math and coding. An author and manager of the MC2 Programming project, he helps fellows deal with STEM disciplines and reach academic goals. Passionate about self-education, Hugh reads a lot and shares his knowledge with others.